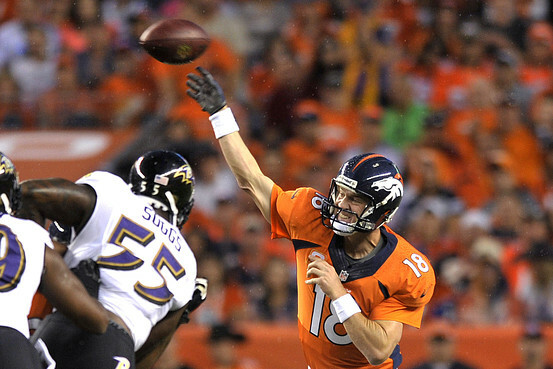 As I predicted, the Denver Broncos covered the 7 point spread that they were faced with in their Week 1 showdown against the defending Super Bowl champion Baltimore Ravens. This continued my hot streak from last year, where I was right on about 60% of my picks last year (skilled handicappers make their living at 55%-60%) and I hope to continue that going into this season. Starting off 1-0 is great, but it really is just one game. Week 1 is always a big week for betting, as many odds makers don't have all of the information that they'll have as the season goes on, so this week should go well! The Bears head into this game as the favorite, but with a new coach and questions about Jay Cutler being able to adapt to the new offensive scheme, along with the fact that his favorite target, Brandon Marshall, is nursing a sore hip, I'll go with the Bengals. I think this could be the start of a big year for "Who-Dey Nation." The only "pick-em" game of the week is going to be a tough one, as both of these teams seem to be at the same point in their rebuilding process. The key matchup here is going to be between Miami's newest weapon, Mike Wallace, and Cleveland's lock-down corner, Joe Haden. As Evan Silva of Rotoworld tweeted on Wednesday, Haden has shut down Wallace the last three times they've faced off. Over these 3 games, Wallace has averaged 2 catches for 25 yards. Yikes. Brendan might not like this pick too much, but I think the Seahawks are the easy choice here. They have one of the best (if not the best) defenses in the NFL, and with Russell Wilson continuing to develop, I think it's going to be a rough day for Cam Newton & Co. at home. Indy is one of two teams that are favored by 9.5 this week, and that's a rather large number for a week 1 game. It really shows what people think of the Raiders this year. 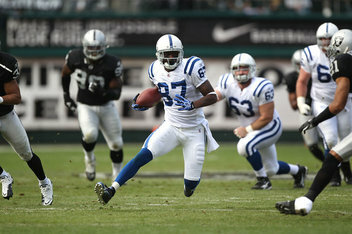 It's going to close, but I think Andrew Luck will be able to fire up the Colts offense to put a big number on the Raiders. The problem with betting on the Lions is that you never know which team is going to show up. On the good side, you have a team that can be one of the more high-powered offenses in the league, but on the other, there's always the possibility of them not being able to find the end zone. I think the addition of Reggie Bush should push them more towards the good side...I'll probably regret this one. The other of the two 9.5 point games, many people have been taking the Bills as their upset pick for this week. While their defense should be solid, it's not going to be able to stop Tom Brady and the rest of the Patriots. This probably won't be the start that EJ Manuel was hoping for. This was one of the tougher picks that I had to make. Pittsburgh will be playing without LeVeon Bell (And Jonathan Dwyer and Rashard Mendenhall, who they decided to part ways with this offseason), so the ground game may be a little bit weak. On the Tennessee side, Jake Locker is still a question mark at quarterback, and he'll struggle against the tight D that Pittsburgh has annually. I think Big Ben will be able to put up some points on this secondary, though, so I'll go Pittsburgh; just barely. New Orleans is the favorite in this game even with the huge discrepancy in the win column between the two teams last season. Sean Payton coming back will certainly help, but it won't be enough to overcome a Falcons team that is solid on both sides of the ball. This could be the first win of a championship season for Atlanta. Another team that is favored even though they're on the road, the Kansas City Chiefs are looking to build on a solid offense that saw them get a new head coach (Andy Reid) and a new quarterback (Alex Smith). They were actually incredibly talented last season, but you can only go so far when your team throws 8 touchdowns the whole season. Look for this season to be a polar opposite of last year for the Chiefs, and that starts in Week 1. With this game, we see another home team that is the underdog. This comes for obvious reasons, given how anemic the Jets' offense is supposed to be, and how strong the Bucs' defense is expected to be, especially given the addition of ex-Jet Darrelle Revis. While I don't have a ton of confidence in Josh Freeman, any concerns about him are offset by Doug Martin. 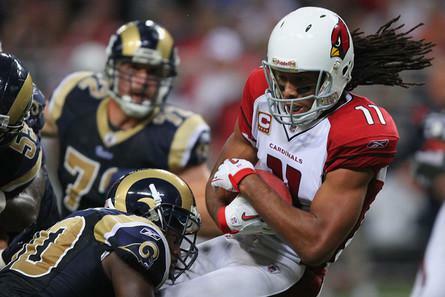 It's a shame that Larry Fitzgerald's career has been hindered by such poor quarterback play over the past few years. Carson Palmer represents a huge upgrade this year (doesn't that say something about the last few years), and should help Fitz return to elite-level production. They also have a solid defense, and this game should really be a nail biter, but I think Sam Bradford will show some real improvement and help the Rams cover the spread. The 49ers came away as big winners in last year's playoffs, downing the potent Packers offense 45-31. Green Bay just didn't have answer for anything Colin Kaepernick was doing, but that won't be the case this year. They've had an entire offseason to think about everything Kaep did, and they'll be ready for him. I think 4.5 points is way too much for the close game this should be, so while I don't necessarily think the Packers will win, I don't think San Fran will cover the spread. 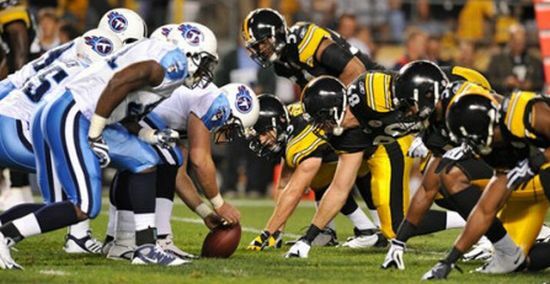 If the Titans vs. Steelers was hard for me to pick, then there isn't a word that describes how difficult was for me to pick this one. Every year, regardless of how each team is doing record-wise, this ends up being a great game. If I was going with my gut, I'd go with the Cowboys, but I'm going to go with my head on this one. We'll see how that works out for me. This game will have a couple of very interesting storylines to watch. On the Eagles side, it is Chip Kelly's first game in the NFL, and his offense that dominated the college game will be put to the test. 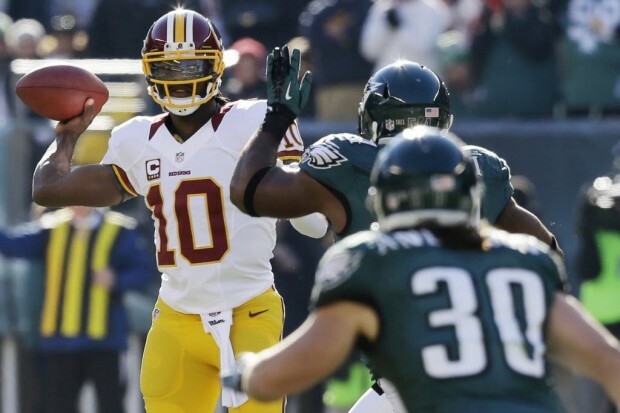 For the Redskins, it is RGIII's first game since tearing his ACL in last year's playoffs. I think that RGIII is going to prove to everyone that he's back to 100% and ready to build on an impressive rookie year. I have a feeling that this is going to be a rather disappointing Monday Night game. These are two teams that are completely different places, as the Texans are going to be competing for a Super Bowl, while the Chargers may be competing for the #1 pick. This was one of the easier picks on the schedule for me, but even with all that confidence, I'd still be cautious, just because it is a primetime game. I don't know about you, but I can't wait for all of these games to start. Good luck to all of your teams (and fantasy teams) this week! Follow Brian Rzeppa on Twitter, and check out his NBA work on The League News.